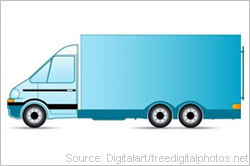 When renting a moving truck for your relocation, there a variety of factors to think about. What size truck will you need? How long will you need it? Do you need insurance? Read on for more information about what you should consider when renting a truck. You will have to consider the size of your home and the volume of your furniture and belongings to determine the truck you require. You want to ensure that the rental truck has sufficient space to avoid making multiple trips to your new home. Truck rental agencies suggest choosing a truck size that is about 10 percent larger than what you expect you'll need. Keep in mind how highly-furnished your home is--if you have a large three-bedroom with many rooms of furniture and other items, you would opt for the 24-foot truck rather than the 17-foot. When relocating via rental truck, distance is a major factor to consider. The cost of your truck rental will be mostly dependant on the mileage, fuel, and the time it is in your possession. Mileage: How far are you traveling? When reserving your truck, make sure you are aware of how much mileage is included in your price (if any), and how much you'll pay for each additional mile. When shopping for truck quotes, this will make it easy to compare prices from a variety of companies. Fuel costs: After you have determined the distance you are traveling, you can calculate the amount you expect to pay for fuel so you have sufficient funds available. Most rental truck agencies will supply the truck with a certain amount of fuel in the tank and require it is returned at the same level. Research diesel fuel prices in the states you will be traveling for a more accurate estimate of the costs you will incur. Time: How long will it take you to reach your destination? When you reserve your truck, you will have to provide a drop-off date. Consider rest stops and hotel stays when determining the length of your trip. When you rent a truck, you will have to choose a drop-off location to return the vehicle after your move is complete. If you are moving locally, you can often return the truck at the same location you picked it up. This is usually the less expensive option. However, if you are moving to a distant city or cross-country, you will have to return the truck at a different location. This is known as a "one-way move" and often carries extra fees. Discuss these details with the rental agency before making your reservation to choose a drop-off that is most convenient for you. The summer--specifically May to September--is known as peak moving season. During this period, truck rental reservations will fill up quickly. If you will be moving during the summer, be sure to book your rental truck several months in advance. The end of the month is also a popular time to move. If you plan your move for off-season or mid-month, you may get a better price. Just like moving companies, truck rental agencies are sometimes accused of fraudulent behavior and unsatisfactory customer service. Before automatically choosing the company offering you the lowest quote, conduct a thorough background check. Check the company's profile on the Better Business Bureau, and scour RipoffReport.com and MovingScam.com for outstanding complaints against the company. Common complaints against rental truck agencies include estimate switches, faulty trucks, failing to hold reservations, adding on hidden fees, and claiming false damage when the vehicle is returned. While a do-it-yourself move will save you money, it requires much more time and effort than hiring full-service movers. Loading a moving truck with a household's worth of boxes and furniture is exhausting and backbreaking work. Be sure to enlist the aid of a few strong friends to lift and carry your furniture and appliances out of your home and load them onto the back of the truck. Always follow the proper procedures for handling heavy items, and use the appropriate tools to make the process easier. You can also hire moving labor services to simply help you load the truck. While this will cost a little extra, it is usually still more affordable than hiring full-service movers to both load and drive. There are several essential moving tools you will need to load your belongings into the moving truck. You can usually rent these from your truck rental agency. When you are reserving the truck, inquire about what types of hand trucks, dollies, straps and furniture blankets they can provide and the costs. You may have to reserve the items at the same time as the truck to ensure they are available for your move. Depending on your auto or home insurance policy, you may or may not be covered for damage in an accident. Be sure to find out this out in advance, so you can inquire about purchasing coverage from your rental company. The agency will provide you with insurance on the vehicle for a small fee per day. The company may also offer you coverage for damage to your shipment. Ask about your options and the cost of each plan, then make the optimal choice for the distance of your move and the value of your goods. Check with your homeowner's insurance for possible coverage of your goods before purchasing a policy from the rental agency--some policies offer protection for your belongings during a move. Is there collision protection if I'm not at fault? Am I covered in all states on my route? Are my goods protected in case of damage? Are my goods protected in case of theft? If you are driving the moving truck long distance, you will have to plan a way to transport your personal vehicle. If you are moving alone, you could consider asking a willing relative or friend to drive your car to your new home. If not feasible, you may have to enlist the services of an auto transport company to ship your vehicle. Depending on the volume of your belongings and the type of vehicle you have, you could also opt to hitch a moving trailer to the back of your vehicle. Need a truck rental quote for your move? Fill out this fast and easy quote form to get FREE moving truck rental quotes today!